Plums There are 17 products. This is the classic purple highly flavoured European Plum. Originated in France but has been widely spread around the world. It's purple in colour and has a rich flavour that cooks superbly and is great eaten fresh. Ripens February. A small round greenish yellow plum with intense flavour (the Cox's Orange of the plums) tends to crop incredibly heavily and then has a year's rest. Great for stewing, eating and bottling. Considered partially self fertile but having another plum (eg Coe's Golden Drop) will increase yield. Small yellow plums with a distinctive sharp but sweet flavour. A favourite home garden tree in Central and Eastern Europe but seldom seen here. Great fresh but also excellent for jams and preserves. Have another plum nearby to ensure pollination. An American prune with rich aromatic flavour. Luther Burbank in one of his many breeding programmes about 1905 turned his attention to breeding a better prune. Splendour is a cross between d'Agen and a Hungarian prune. It's long in shape, dark purple with a yellow flesh, and sweet to taste. Estimated 11% sugar (parent d'Agen has about 8%). This plum is most fondly remembered by English immigrants. Its skin is pink, the flesh a clear yellow and the stone slips. An amazing producer - needing supports under the ladened branches when almost ripe, to prevent limbs breaking. 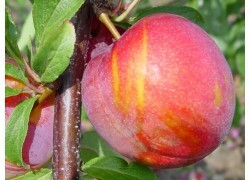 Considered self-fertile bue will crop better near another European plum. 'Introduced' into Tasmania the 1950s by Frau Ziegler from Germany. This 'Zwetschge' is a German prune, used for drying, pies, jams and preserves. They have a sharp rich nostalgic taste and ripen fairly late, here about March. Needs any other of our plums for pollination. Burbank is a Japanese plum, medium sized with yellow flesh and red skin. Excellent flavour, early to mid ripening. Usually has a 'wax bloom' coating that polishes off easily. Can tolerate cold quite well and equally low chill climates. Partially self-fertile, will produce more fruit when pollinated by another Japanese plum e.g. 'santa rosa'. Mariposa is a japanese blood plum, medium sized fruit with redish skin. Sweet, soft dark blood flesh with a small pip, almost free-stone. Low chill. Partially self-fertile, will produce more fruit when pollinated by another Japanese plum e.g. 'santa rosa'. Black Amber is a large japanese plum, dark almost black in colour, with pale flesh that's amber when ripe. Great memorable flavour, juicy flesh - making it excellent for eating, but also for cooking, sauces etc. Small pip. Pollinated by another Japanese plum e.g. 'santa rosa'. Santa Rosa is the a red fleshed Japanese plum, with medium sized fruit and a deep red skin. A prolific bearer, self fertile and reliably pollinates other japanese plums. Widespread popular variety grown commercially, Bred by Luther Burbank in around 1906 USA. Low Chill. A small round greenish purpe plum with intense flavour, similar to the greengage. Also called Rein Claude Violette. Great for stewing, eating and bottling. Free-stone. Considered partially self fertile but having another European plum will increase yield. Satsuma is a well known red fleshed Japanese plum, with medium-large sized fruit and a deep red skin. 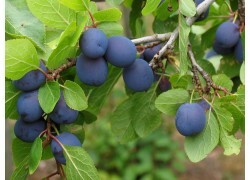 A prolific bearer, partially self-fertile and pollinates is is pollinated by other japanese plums. Another Japanese plum - Sweet, juicy and soft with yellow flesh and a bluey purple skin. Needs to be pollinated by another Japanese plum e.g. 'santa rosa'.